Groundbreaking cultural discourse will be attained through expertly designed exchange programs and innovative films and television programs that promote tolerance and democracy. > Identifying superior exchange candidates, such as educators, artists and cultural workers, uniquely skilled to contribute to meaningful discourse. > Engaging Organizations representing Diaspora communities, including Arab, Iranian, Afghan, Israeli and North African to become project partners. 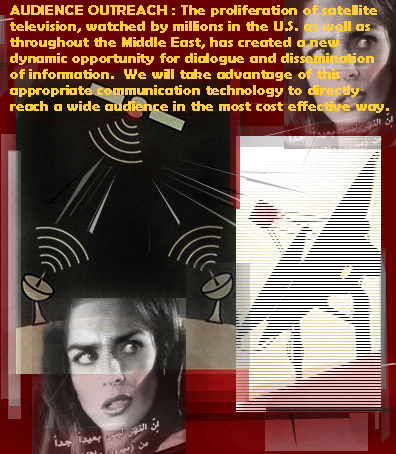 > Employing advanced and creative communications technologies to produce documentaries, talk shows, feature films, soap operas and to distribute through satellite transmissions reaching hundreds of millions of people and directly impacting the shaping of public discourse in Israel, the Arabic-speaking world, Iran, Afghanistan, in synergy with online communities as a means to maximize project reach, efficacy and outcomes. > All programming to be distributed in English, German, Arabic, Farsi and Hebrew. > Organize traveling art exhibits, video installations and film festivals in collaboration with such cultural institutions as the Goethe Institute and the Asia Society.